What Specific Evidences Support the Resurrection of Jesus Christ? 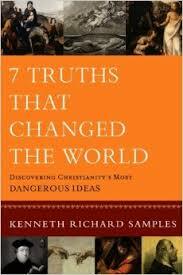 Kenneth Richard Samples in his book 7 Truths That Changed The World: Discovering Christianity’s Most Dangerous Ideas, gives seven evidences that support the truthfulness of the resurrection of Jesus Christ. Jesus’ postmortem appearances. He appeared to women, men, friends and even enemies. He appeared to individuals, small groups, and large groups. He was encountered in the morning and in the evening. He was seen, heard, and touched. His appearances were physical and bodily. Emergence of Sunday as a Day of Worship. Pingback: Microchip Technology and the Return of Jesus Christ | When is Jesus Coming Back? Who wrote the Gospels? For what purpose were the Gospels written? Is there any evidence to support the belief that these four first century books were written as eyewitness, historical accounts? If it turns out that we do not know who wrote these books, and we do not know for what purpose these books were written (for all we know, they could be historical fictions, written for entertainment purposes only), then doesn’t the entire foundation of the “evidence” argument for the Resurrection fall to pieces? Gary, thanks for commenting! There’s a ton of extra-biblical evidence for the historicity and veracity of these accounts. I’d love to talk more. My email is natemillican@gmail.com.